The MAYSLAKE PEABODY ESTATE procurement commission is located in Oak Brook, Illinois. 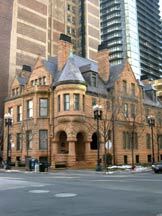 The CABLE HOUSE is a Richardsonian Romanesque design. Built in 1886 by the architects Cobb and Frost. The house was built for Ransom R. Cable, the president of the Chicago, Rock Island and Pacific Railway and Pacific Railway Company. 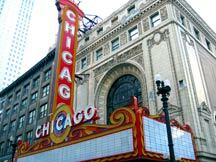 Designated as a Chicago Landmark on October 2, 1991. The investment firm of Driehaus Capital Management, Inc. currently own and occupy the building. The Richard Driehaus assignment was a multi facet project requiring several years to complete. The work of Renaissance and Baroque artists was researched extensively. Relying on Art Deco, Baroque and Louis Sullivan designs as Historical references, while incorporating personal sketches from nature studies, was able to transform the six bathrooms, entry foyer ceiling and the carriage house of this Mansion into unique timeless jewels. 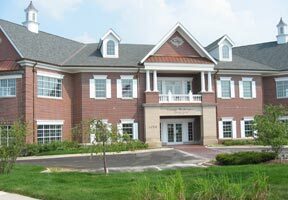 George Washington Savings Bank located in Orland Park, Illinois. Both outside and inside are true to the details of the late Georgian period.